The Complete Fire Inspector I and II Training Solution! Fire inspectors need to know how to interpret and apply national and local codes and standards in the office and in the field. 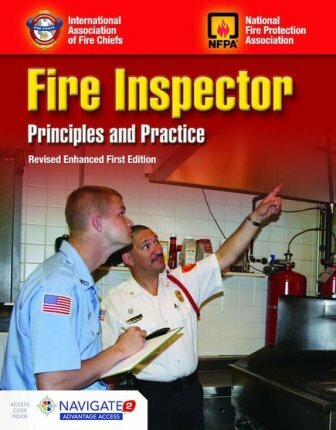 Fire Inspector: Principles and Practice is designed to prepare fire inspectors to ensure the highest standards of fire and life safety in their communities. 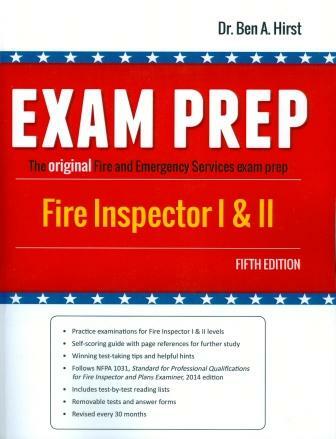 This textbook meets and exceeds the job performance requirements for level I and II fire inspectors from Chapters 4 and 5 of NFPA 1031, Standard for Professional Qualifications for Fire Inspector and Plan Examiner, 2014 Edition. Fire Inspector: Principles and Practice is built on a solid foundation of the basics: building construction, fire growth, and types of occupancies. This fundamental knowledge is presented in a concise, understandable writing style that is easy to digest and recall. The solid foundation of fire and building knowledge then branches out to show the fire inspector how abstract concepts and codes will be concretely applied on a daily basis. This is the text that truly prepares fire inspectors for the real world. Scenario Based Learning - You are the Fire Inspector and Fire Inspector in Action case studies are found in each chapter to encourage critical thinking skills. Practical Tips - Fire Inspector Tips and Safety Tips provide helpful advice from experienced fire inspectors. Page References - Page references offer quick access to coverage of NFPA 1031 Objectives and the National Fire Academy’s Fire and Emergency Services Higher Education (FESHE) Discipline-Specific (Fire Preventions) Principles of Code Enforcement course at the beginning of each chapter. Level Classification. Material for Fire Inspector II candidates is highlighted throughout each chapter. Each new print copy of Fire Inspector: Principles and Practice also includes Navigate 2 Advantage Access that unlocks a complete eBook, Study Center, homework and Assessment Center, and a dashboard that reports actionable data.